Burlington, Vt — Truth Wins Out has exclusively obtained a letter from psychologist Dr. Robert Spitzer officially invalidating his infamous 2001 study which claimed that some “highly motivated” homosexuals could go from gay to straight. Spitzer’s letter was written to Dr. Ken Zucker, editor of theArchives of Sexual Behavior – the journal that originally published Spitzer’s research in 2001 but has yet to print a retraction. In light of this development, TWO slammed the many anti-gay and “ex-gay” groups that continue to cite Spitzer’s study on their webpages. In the letter, Dr. Spitzer further explains that his study’s “fatal flaw” is that it was predicated entirely on changes in sexual orientation reported by the patients themselves. 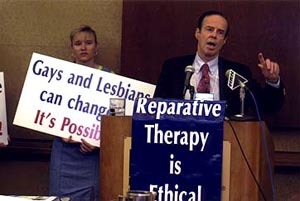 He said, “…the simple fact is that there was no way to determine if the subject’s accounts of change were valid.” This brings Dr. Spitzer into agreement with every mainstream organization of medical and mental health professionals, all of which condemn so-called “reparative therapy” as both ineffective and potentially dangerous.